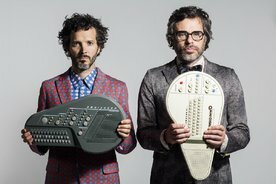 HBO turned Flight of the Conchord’s 2018 London shows into a special with the Ronseal name of Flight of the Conchords: Live in London. Get used to those words, because they’re about to be used a lot: the shows are now going to be turned into a live album. Yes, obviously it’s still called Live in London, but it features many of the classics plus some new ones, including the NSFW rudity of Iain and Deanna which you can stream below. It’s about a night of passion between two office workers and in no way should be played loud in an office. Sub-Pop are releasing the LP on March 8th.